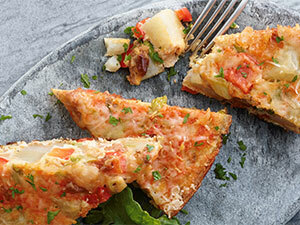 This versatile frittata-style recipe, a traditional tapa at Spanish restaurants, makes a good snack any time of day. The egg-based tortilla is filled with potatoes and chorizo, making it a smart choice to attract "second breakfast" customers in midmorning or to serve as part of a shareable appetizer sampler. 1. Preheat oven to 300 F. In medium saucepan, combine potatoes and enough water to cover. Bring to a boil; cook potatoes about 5 minutes or until fork-tender. Drain and set aside. 2. In skillet over medium heat, cook chorizo until done. Add oil to any fat in pan; stir in onions and garlic and saute until soft, about 5 minutes. Set aside to cool. 3. Line baking sheet with parchment. In medium bowl, combine eggs, cooked potatoes, chorizo, onions and garlic. Heat a 10- or 12-inch nonstick skillet over medium heat. Pour half of egg mixture into heated pan, smooth to even 1-inch thickness. Cook 4 minutes on one side; invert onto prepared baking sheet, cooked side down. 4. Bake tortilla in preheated oven for 10 to 12 minutes or until set, crispy and uniform in color. 5. Serve garnished with tomato wedges and caramelized pickled onions or green salad. Photo courtesy of Idaho Potato Commission.